Different in almost every detail from the older SV11, SV11A/B and SV12 models, the Type 13 (and its main accessory range) was based on the same established European design* (developed originally by the German companies Deckel, Thiel and Maho) that allowed the fitting of different heads (horizontal, standard vertical, high-speed vertical and slotting) in combination with a variety of tables (plain, plain-tilting and compound swivelling). The heads were all mounted on a housing, able to be driven backwards and forwards by a handwheel to provide an in-an-out feed, and the tables on a vertical T-slotted knee with power longitudinal and vertical feeds. By juggling this combination of options, and utilising other accessories, a skilled technician was seldom defeated in his attempts to produce the most complex of milled components to a very high standard of accuracy. Proof of the type's success is evident in the number of similar machines* made in various European countries. Both complex and beautifully executed, the design, was ideal for the manufacture of one-off parts and the forming of tools, templates, punches, dies, gauges, forms and for use in laboratories and prototype and experimental departments. Today, prices having fallen to reasonable levels, these machines are highly sort after by both self-employed engineers and the more knowledgeable of model engineers and home-shop machinists. Although the Schaublin 13 differed in several ways from the original Deckel design the single biggest change was the incorporation into the drive system of a variable-speed unit (as well as a gearbox for low speeds), that gave an infinite range from 56 to 2100 rpm. controlled by a rotary dial on the left-hand side of the machine and a high/low-range selector lever immediately above it. Drive gears were all made from hardened and ground chrome-nickel steel, as was the main spindle which ran in high-precision roller bearings. 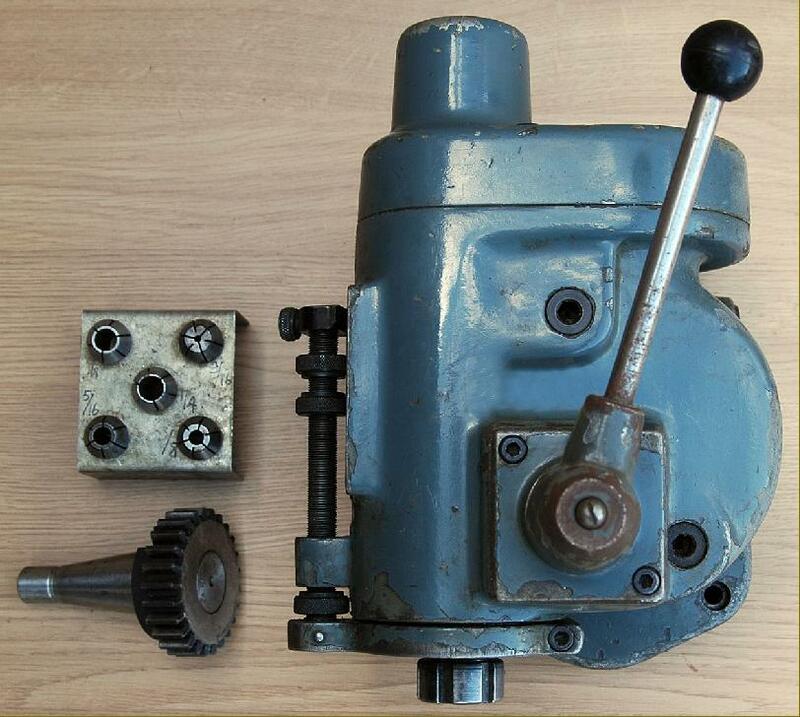 The front face of the "spindle head" was fitted with two overarms to accept a vertical milling attachment, a high-speed milling and drilling head, a slotting attachment - and to provide support for long cutter-arbors. Schaublin Model 13 Universal Miller fitted with the standard table. Fitted with a No. 4 Morse taper, the spindle was provided with sleeves to accept either P-Type (25 mm-shank) collets with a maximum bore of 20 mm, or 2 and 1 Morse taper bushes. 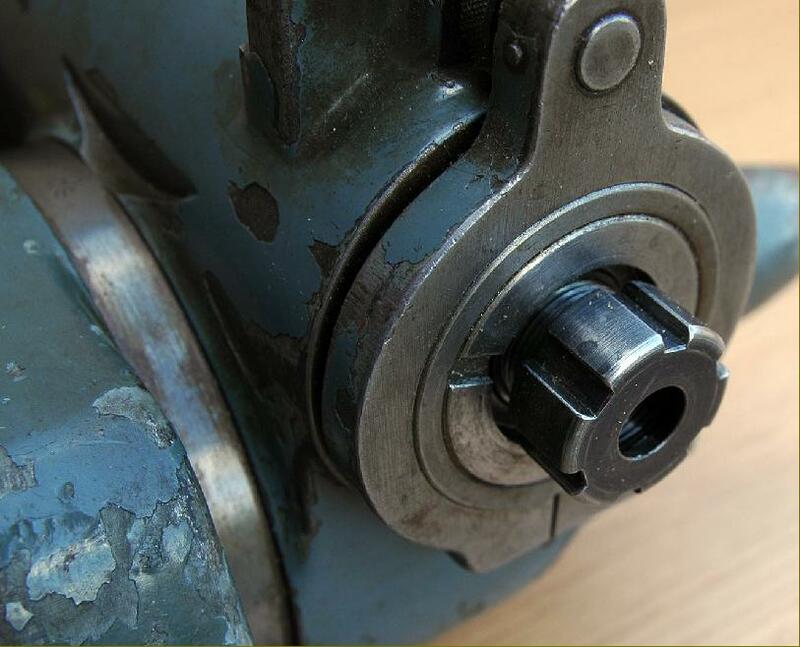 An adjustable lever on the right -hand side of the machine started and stopped the motor and a device was fitted so that the direction of rotation of the motor (and hence the cutter) could be changed without altering the direction of power feed to the table. The 8 rates of table feed (horizontally and vertically), of 11 to 210 mm/min were selected by a very inconveniently positioned rotary control at the left-hand rear-side of the main column. Although the table-feed rates were independent of the main motor (the feeds gearbox was driven by an extension from the main motor) this was an arrangement that could give rise to problems: a torque-limiting clutch was fitted in the feeds-box drive pulley and when high rates of traverse speeds were selected (with the motor running) an operator unused to the system could find the feeds appeared not to work. However, the correct technique was to pre-select a high traverse speeds with the main motor stopped and the, using the variable-speed control, increase the spindle speed gradually. Some models were fitted with a separate motor (operated by a foot control) to drive a table rapid return mechanism and this too was fitted with a clutch - adjustable (like the table-feeds' units) provided the technician could get at them. 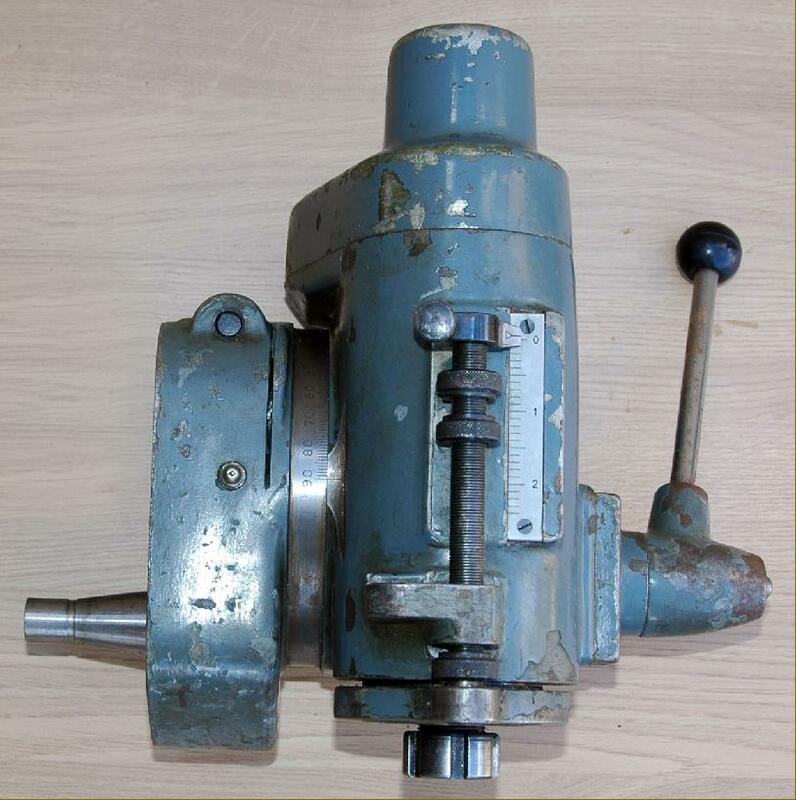 Provision was made to allow the fitting of length-bar holders with dial indicators as well as a centering microscope, so equipping the machine for jig-boring work. Many of the accessories could also be adapted from, or used on, the Model 102 lathe, so saving a considerable sum of money if the workshop was already lucky enough to be fitted out with Schaublin machines. 1240 mm deep, 800 mm wide and standing 1500 mm high the Schaublin Type 13 weighed 440 kg. Alexander "Master Toolmaker" and the Ajax "00", an import of uncertain origin. Bandini Model FA-1/CB and badged as Fragola (agents, who also sold a version of the Spanish Meteba). United States: Brown & Sharp "Omniversal"
"Comet" Model X8130, imported to the UK in the 1970s by TI Comet. Sloane & Chace in the USA produced a miniature bench version and at least five Chinese-built models have also been made, including one from the Beijing Instrument Machine Tool Works. A number of the "clones" merely followed the general Thiel/Maho/Deckel concept whilst others, like Bandini and Christen, borrowed heavily from Deckel and even had parts that were interchangeable. Should you come across any of these makes and models all will provide "The Deckel Experience" - though you must bear in mind that spares are unlikely to be available and, being complex, finely-made mechanisms, they can be difficult and expensive to repair.. High-Speed vertical milling & Drilling Head to take E20-type collets and with spindle speeds from 170 to 6400 rpm. 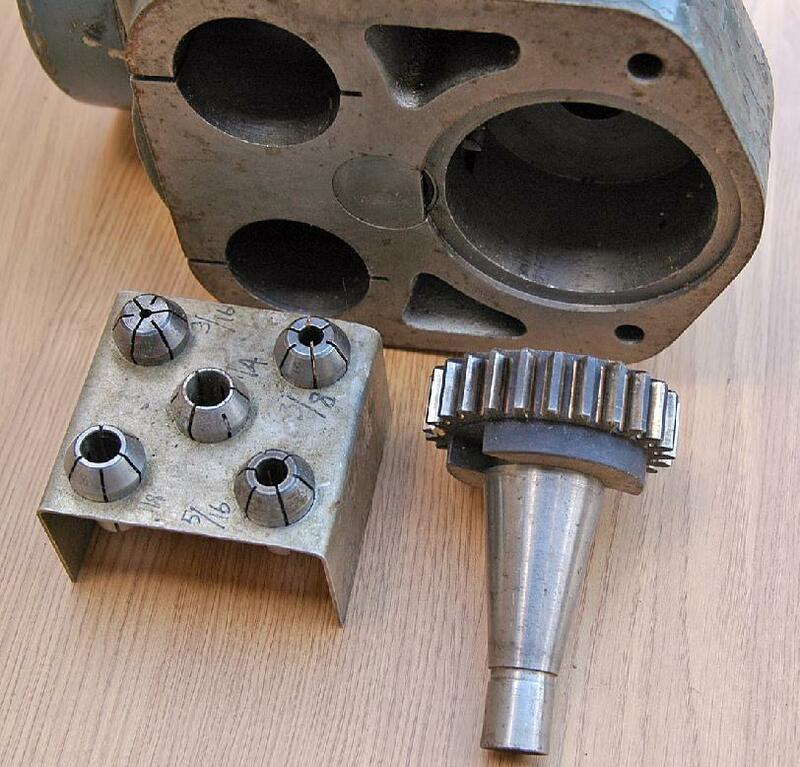 Standard Vertical Milling Head with speeds from 56 to 2100 rpm. Universal Swivelling table 600 mm x 260 mm with 5 slots at 50 mm spacing. This is the table which formed the basis of the miller's ability to tackle the most complex jobs. Handwheel with vernier scale for horizontal movement of the milling table. Base Plate - with a pivot and circular groove for fixing a saddle up to 230 mm long and, having the same bed section as that of the 102 lathe, allowed the dividing head No. 17 to be mounted vertically. Inclinable Angle Plate - fixed to the base plate above and able to take a saddle with the same bed section as that of the 102 lathe.